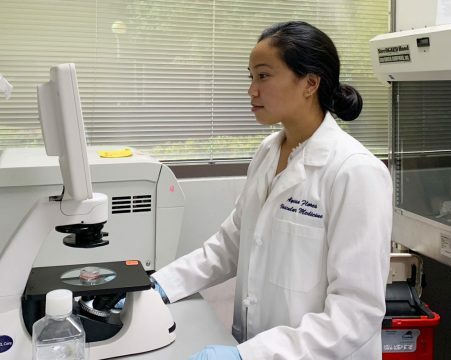 Geisel School of Medicine student Alyssa Flores ’20, part a team of Stanford University School of Medicine researchers who published a study on venous disease in the journal Circulation, says they found height to be an unexpected risk factor in developing varicose veins. The study, which received national attention, also discovered a strong genetic overlap between varicose veins and deep vein thrombosis, a serious condition in which a blood clot forms in the deep veins. Alyssa Flores ’20 in a lab at Stanford Medical School. Flores, a Howard Hughes Medical Institute (HHMI) Medical Research Fellow, presented the results at the American Heart Association meeting, Vascular Discovery, for which she received the 2018 Peripheral Vascular Disease Early Career Investigator Award. Flores has spent the past year at Stanford working with Nicholas Leeper, MD, an associate professor of surgery and of cardiovascular medicine—senior author of the study. Sharing lead authorship of the paper with Eri Fukaya, MD, PhD, a clinical professor of vascular surgery, she says being part of the research team has, “been an incredibly formative experience” for her career. “I’ve had time to develop myself as a researcher—both in skills and in understanding how to think about problems in cardiovascular diseases, and how to best tackle them.” Leeper Lab studies the vascular biology of atherosclerosis and aneurysm disease. The varicose vein study is a departure from her work, but with Leeper as her mentor, she became involved. In the largest study of its kind, Flores says the team utilized machine learning—a type of artificial intelligence—to plumb the depths of data gathered on nearly 500,000 individuals in the UK Biobank to confirm common risk factors for varicose veins. While the study confirmed established risk factors, it found a previously unknown risk factor— greater height. “I think it was surprising because height isn’t one of the traditional risk factors we think about, but machine learning was able to screen all the data in an unbiased way and find out that height was very strongly predictive of whether someone develops varicose veins,” Flores says. In addition to height, a measure of the body’s ability to impede electrical current flow was revealed as a predictive marker for varicose veins. The study also discovered genetic determinants of varicose vein disease that may be useful in identifying new targets for treatment. Primarily interested in efferocytosis—the natural process of clearing dead and dying cells from our bodies—Flores has received additional funding from HHMI to continue working with Leeper during the 2018-19 academic year, continuing her original research on designing a drug therapy to boost the immune system’s ability to clear these abundant plaques. When this activity goes awry, a build-up of these diseased cells in the arteries may be responsible for heart attack and stroke. Grant funding from the National Institutes of Health (grant1R01HL135313) and the Knut and Alice Wallenberg Foundation supported this study.